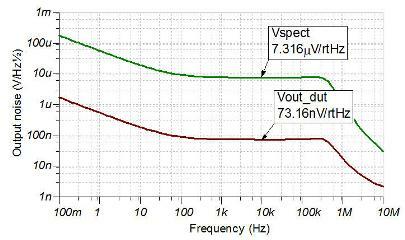 In some cases a scope or spectrum analyzer does not have the range required to measure very small noise levels. This noise measurement post-amp boosts the output noise of the device under test (DUT) to allow for measurement with standard test equipment. The key requirements of this circuit is that it has a low noise floor and sufficient bandwidth for characterization of most devices.